Guess what?? The chairs for our living room come in today! I am so excited, as these pieces will really put the finishing touches in that room as far as furniture is concerned. We still have more decorating to do and who knows if that rug will ever come in?! But this is a huge step… and now on to my reason for being here today! Because of the typical layout of homes in our area, the second full bath is in the basement and we don’t have an actual “master bath,” but for some reason I can’t help but call it that! Our “master” is the only bath on the second floor and accessible to all from the hallway. In fact, the top of the stairs dumps you off right at the entrance. This was probably the “room” I hated most in the house. There was this nasty tile going three quarters up the wall and everything seemed dingy. You want your bathroom to feel clean and fresh! The white beadboard and blue paint give it a cottage feel, helping to give the room “light” even though we don’t have a window, and the marble tile looks pretty classy if I do say so myself. Now we just need some art on that bare wall… maybe a framed print like this? 1. We came home yesterday to find this sweet gift in the mail from my Aunt Bev and Uncle Ron. I’ve been wanting these nesting measuring bowls for a while actually, and the towel fits in nicely with the rest of the green in our kitchen. How thoughtful! 2. Speaking of nesting, here’s a peak into some of the decor around the home. It’s still a work in progress, but the final touches will be in the living room along with some various spots around the house that need an objet d’art or deux. The living room is almost fully furnished – our chairs should get here on Friday! – and then the only BIG thing left will be to refinish the furniture in our master bedroom. If that ever actually happens, I will be a happy girl! 3. Our neighborhood library recently underwent a renovation and re-opened yesterday. I haven’t been yet, but looking at these pictures makes me even more excited to go than I already was. LOVE the archways and doesn’t that fireplace look cozy?? 4. 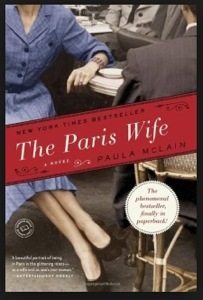 I just started reading The Paris Wife, which is about Ernest Hemingway’s first wife Hadley. I love using my kindle because it’s just one item to carry around that can hold all of the books I could even consider reading at one time, making it perfect for commuting! The DC library system has an e-book loan program so I don’t need to visit #3 for books, but it still looks like a nice place to read. Next on my list is either the Harry Potter series (I know, I am waaaaay behind) or The Hunger Games (only slightly behind.) What books are y’all reading?? tuesday things: home decor galore! It’s really hard to think about anything else other than the fact that we close on Thursday!! My every thought relates to the new house – paint colors, tile flooring, bathroom vanities, faucets, lighting… the list goes on. So today I am sharing things I am thinking of buying for the house and the ways we’ve discussed decorating. Let me know what you think! entryway table: I’d love to do something like this, especially with the vintage suitcases! So I’m thinking I may start with this table! coffee table: It’s really difficult for me to pick out a coffee table until we’re sure of the couch and side chairs, but since I have an idea of what we plan to get, and I KNOW we need storage, I am thinking a trunk-like table such as this Rebecca Trunk from Pottery Barn! accent chairs and throw pillows*: As I mentioned, we have not yet picked out a couch or chairs, but I am 99% sure we’ll go with a solid gray couch and side chairs that incorporate cream, gray and/or blue in a pattern. large clock: I love, love, love these large clocks! I saw some at Lowe’s or Home Depot on Sunday – I can’t remember which one because, yes, we spent hours in both stores. wagon, barrel or wheel barrow-style planter: We have a tree stump in the front yard that I’d like to cover up in a creative way, so I am thinking that I could get something like this! I’ve also looked at the following two as options for a planter container. Other fun things we’d like to buy that are totally not necessary, and will likely have to wait for a while, include a kegerator and a dual-zone wine fridge!